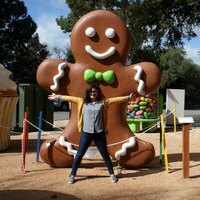 Everyone is welcome to the party which kicks off at Maria Hernandez Park. 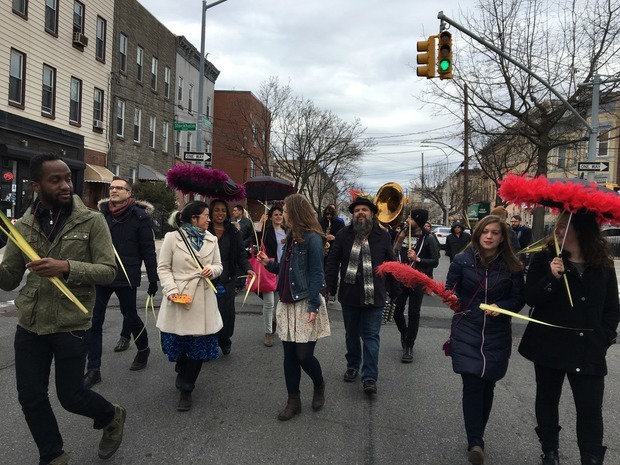 For some, early April is all about Easter, and Bushwick Abbey is celebrating Palm Sunday—April 9 for those who have forgotten—with a raucous parade through the neighborhood's streets. Palm Sunday is a feast celebrating the moment when Jesus walked into Jerusalem to throw "out the moneychangers and reclaim the space for the people" according to Vince Anderson, the parade's organizer. Even though the feast itself has its roots in religion, Anderson says that "though the genesis of it comes from Christian tradition, we feel the message of Palm Sunday is universal. We hope that the parade celebrates the power of the people. It is our hope that the parade becomes a spontaneous happening in which the people of Bushwick take to our streets, shut them down to the business of the day, and use them instead for music, dancing and getting to know one another." The full brass band traipsing down the street is sure to put you in a celebratory mood for the parade even if an event put on by an Episcopal church is not on your usual list of weekend activities. "We encourage people to come as they are. Dress up. Carry signs and parasols. Bring puppets and animals. And dance in the street," Anderson adds. 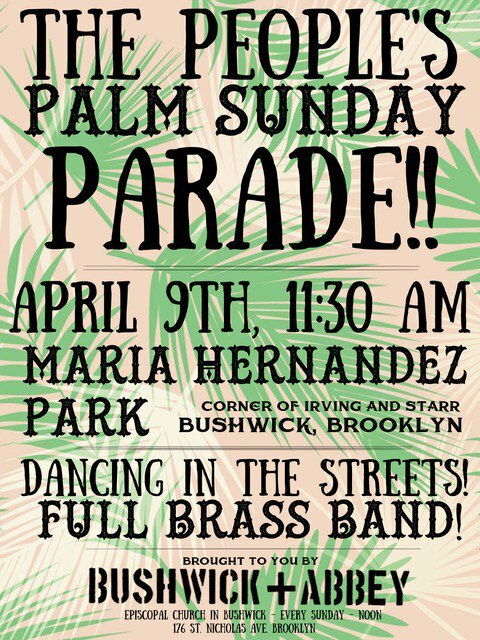 Join the revelers at 11:30 a.m. on Sunday, April 9 for the People’s Palm Sunday Parade, which will start from the north end of Maria Hernandez Park on Irving and Starr Streets.